As we have already discussed and explained before, the crisis is now taking a more geopolitical form. Does this mean that the economic-financial crisis is over? No one will accuse us of having pretended that. If need be, we can confirm that the crisis is always there, always vivid, and it is in perfect shape after more than eight years of existence, thank you very much. One of the best signs of this is the employment rate in Western countries; but also the difficulties experienced by other major states such as Brazil or India; the fall in oil prices in the past two years; or even the social upheavals, among a thousand other bright red indicators. 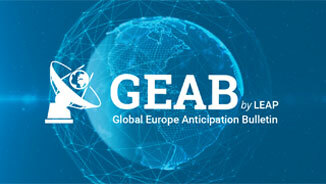 Nevertheless, as we begin to understand that the only thing the QE has done was to inflate the financial bubbles and push back very much needed problem-solving, finally we see an emergence of ideas in economic revival through renovation/creation of infrastructure, which is badly needed in the main Western countries. But, with the heap of public debts accumulated since 2008 (knowing they have served the revival of the private economy and still serve to keep it at arm’s strength), do governments have the capacity to operate this Keynesian-type of revival (a taboo which has been crumbling lately)? Also, will the famous financial markets allow this revival, backed on low enough interest rates? 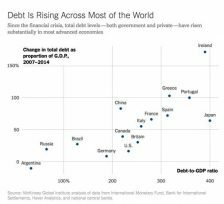 What is the debt level in different regions of the world? 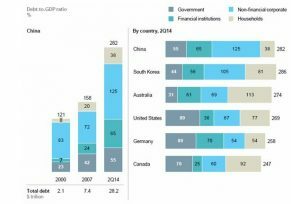 Total debt (government and private) to GDP ratio (2014) and the rise of 2007-2014. Source: New York Times. Reading the Anglo-Saxon media, one could see the next (and huge) problem as coming from China and its colossal debt; but knowing how important disinformation is within the US strategy and their controlled media, can we rely on this analysis? More generally, how to manage all these debts once the crisis is more or less stabilised? Obviously, nothing is very transparent when it comes to China. The country’s financial situation is definitely no exception. 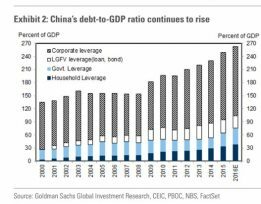 Unfortunately, we must rely on American sources (the impartiality of which is questionable (Goldman Sachs, for example)), in order to have a fair vision of the Chinese debt. It is true, nevertheless, that the situation is worrying. China, government and private debt-to-GDP, 2000-2016. Source: Business Insider. In total (government, households, companies), China’s debt-to-GDP ratio would thus reach 260% (or even more according to other studies), which is quite significant for a “developing” country; one which is even doing more than many “developed” countries for that matter. 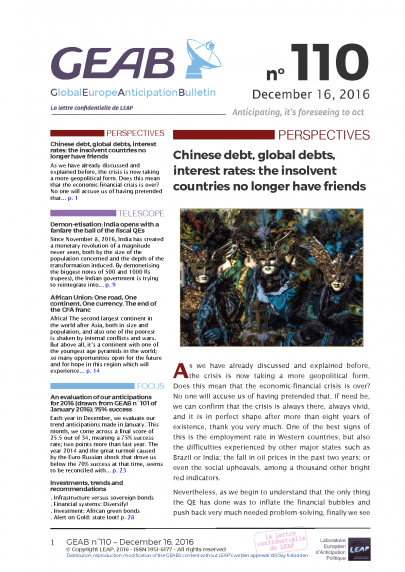 Analysis of the Chinese debt and comparison at international level, 2014. Source: Bloomberg. Comparisons are further complicated if we consider the notion of “intra-government” debt, the public debt (of the government) held by another public institution. These debts do not appear to be a problem in the United States, where they are generally considered to be counted as “doubled” (something not completely unfounded) and often withdrawn from official government debt figures. But when they are Chinese, these same debts seem to give a lot of concern to the Anglo-Saxon economists. Strange, isn’t it? Indeed, the bulk of China’s debt consists of state-owned enterprises borrowing from public banks, following a government order. The amount of money in circulation thus increases (much like the QEs of the Fed or ECB), but the external debt is not affected. The “only” impact should be an increase in inflation or a decrease in the velocity of money, accompanied by a decline in the yuan, and possibly a bad capital allocation; but no danger of over-indebtedness (as for a QE, with the notable difference that money is not injected into the financial markets, but into the real economy). Thus, the velocity of money has decreased by 15% in China since 2008, because of the increase in the amount of money. 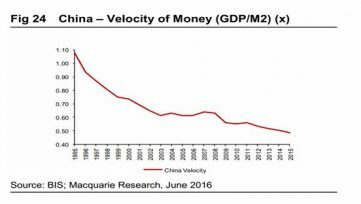 Velocity of money (M2) in China, 1995-2015. Source: Epoch Times. Moreover, the main part of China’s debt is held in the interior of the country. This is much like Japan, for example, which is a country not blamed at all for its much larger debt. Finally, there is this last point allowing us to understand the Chinese situation: politicians have not (yet?) 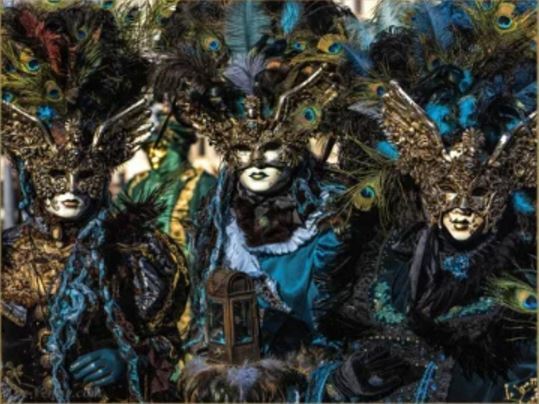 conceded their power to the financial markets, and it is they who allocate the capital (via public banks), allowing to prioritize employment and social stability over profit. This is probably what helps the country and its enormous population to hang in there. Yes, the Chinese debt is high. Yes, it is increasing at a frantic pace (around 15-20% per year since 2011 in absolute figures, about 10 percentage points higher than the GDP). Yes, this debt is obviously a problem for the Chinese government as growth falters. But since it can be seen as a stimulus to a booming economy, as it is mainly held in China and mainly between public entities that lend to one another (giving a much lower net final result), we estimate that the problem of Chinese debt is still quite manageable. Remember that the Chinese government has the advantage of still having power over its economic and financial policy (this is one of the reasons why China is very cautious about its openness to foreign capital).